There are still a few boxes around, but we're nearly there. My stationery is halfway unpacked, and I believe I shall complete that unpacking (along with a slight reorganization, of course) this afternoon. I don't know yet where outgoing letters will sit - we don't have that fun staircase like we had in our old apartment, but I'll figure something out soon. I also don't yet know where my prime letter-writing space will be... we'll just have to live here a while to find the best domestic patterns for this new space. Thanks for everyone's kind moving comments and good wishes, and I hope to be back in the groove of regular mail posts soon. Congratulations! Soda looks like she is at home, I hope you feel in the same way as she does! Happy august to you too . Oh, so many decisions to make about where to write, where to put letters (in & out) and lots of other fun stuff. At least Soda has found a spot to chill out with a beer for the time being. Good luck with all your unpacking and setting up your new favorite spots to do your letter writing. Congratulations on the move and getting things situated; I'm sure all will be as it should before you know it! Whew, you're in. It'll be fun "being with you" as you discover the how and where of correspondence in your new home. Congrats. Glad to hear there's light at the end of the moving tunnel. And from your window as well ... nice view! Soda is looking a bit too possessive of that beer. Is it time for AA for cats? Hope you get everything homey soon so Soda can lay off the brewskies. I'm a newer reader to your blog, although, I think that I've left a comment here before. I love your site and it's concept. I recently (3 months ago) moved and I still have boxes to unpack and things to organize. For me, I have to live in a space for a while to see where I want to put stuff. Congratulations on your safe move. Enjoy! 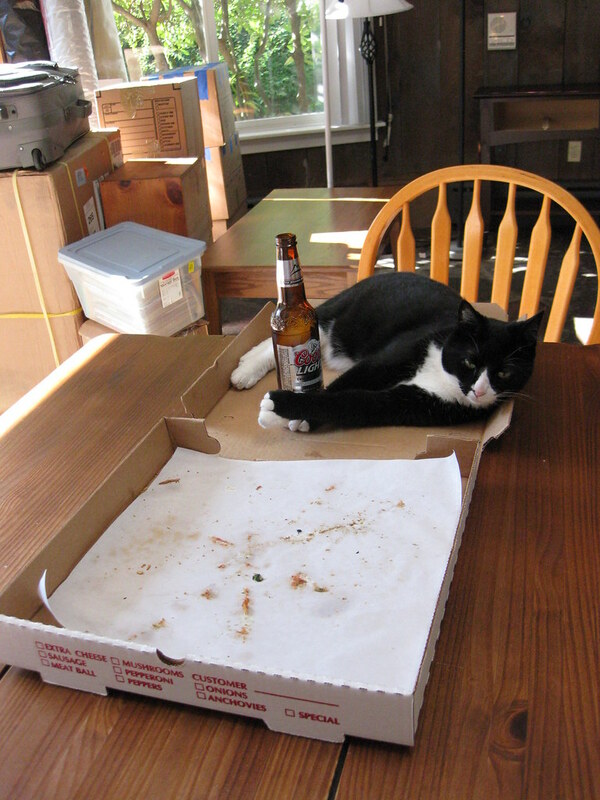 Beer and pizza. You have one cool cat!